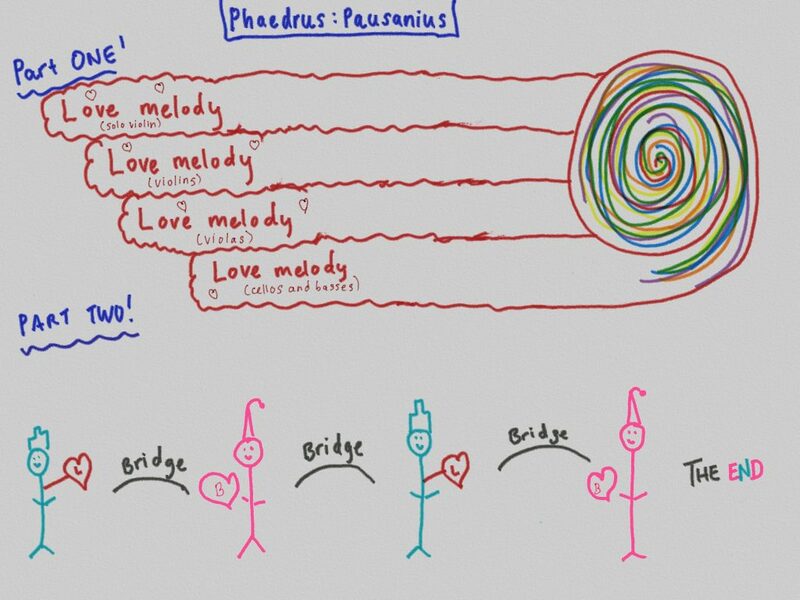 The first movement, Phaedrus:Pausanius, is in two parts. It opens with the solo violin playing a melody alone. I imagine this is someone (Phaedrus? Bernstein? Everyman?) simply talking about Love. The tempo is slow; the mood is contemplative and tender. The melody meanders up and down and then resolves. After the solo violin plays the melody, the first violin section of the orchestra enters playing the exact same melody (although it starts three notes lower than the original.) This happens at :56 seconds on the Spotify recording above. When they have finished, the viola section joins and plays the same melody again three notes lower (1:52), and then the cello and bass section start to play the same melody again three notes lower (2:45) but the excitement has built up by this point and it all swirls around into the Second Part (2:58). This method of layering melody is called a fugue (see J.S.Bach). The second part of the first movement is graceful and energetic. Bernstein says that it “describes the duality of lover and beloved.” So within the second part, there are two even smaller sections. Let’s call them “L” for Lover and “B” for Beloved (or “L”eonard “B”ernstein)? Here’s a short excerpt with piano of the beginning of part L.
And a short excerpt with piano of the beginning of part B.